I was a hot, sticky mess. Only 3 hours in the desert and my mind had gone still. Still from the silence around me, but also still from the lack of thoughts in my brain. As far as my eyes could see, the desert loomed ahead. Pink and orange sand dunes stretched out endlessly ahead of me, leading me to a horizon that seemed altogether new. For once, my mind was not racing. For once, I was not thinking a million thoughts at the same time. My mind grew still. After a few minutes of absolute silence, he came and stood next to me. I nodded. After 2 years of living in the Middle East, I finally understood the allure of the desert. How looking at endless sand dunes can still your brain, stir your heart and forever penetrate your soul. I had stopped craving for green, tropical lush vegetation and instead started appreciating the gentle slopes that sand can make when piled up together, or the simple contrast it could form under a clear blue sky. “This place is so beautiful. Why would you ever want to leave?” were the words I found myself asking. The Bedouin looked at me, and smiled. Perhaps our expat lifestyle was not so strange after all. Perhaps, our wandering souls were not to be seen as the exceptions but rather the norm. Perhaps all of us would be so much happier, if we could answer the restless call in our souls. Perhaps life was not meant to be lived in one spot only. Perhaps, our addiction to wander had no cure. Perhaps it wasn’t an ailment to begin with. Perhaps, it was a gift instead. A gift to grow, in new directions and in new places. A gift to discover and explore. A gift that allowed us to be who we really are. Authors Note: These pictures are taken from my experience and talks with the Bedouin in Wadi Rum, the largest desert in Jordan. The stewardship of this desert lies with the local Arab Bedouin. Jordan is home to approx 380,000 Bedouins who settle in or near Wadi Rum. Our guide Omar pictured here explained us a lot about the Bedouin way of life and their culture. If you are visiting Jordan, I highly recommend a visit to Wadi Rum and a chance to meet and talk with the local Bedouin. You can book jeep tours at the Visitor Center in Wadi Rum. Mariam, I accidentally stumbled upon your website, and loved this post of yours. I am originally from Pakistan, lived in Salt Lake City, Utah after marriage, and moved to Khobar, Saudi Arabia a year back– a country I never imagined I would think of moving to/pushing my husband telling him it is the right thing to do as I feel good in my heart about the move. I simply cannot say it in words how much I feel connected to the people here, the land, and the desert sunsets. There are days when I miss Utah – a desert of its own kind with lakes, mountains, powder, and friends like family. “Perhaps, our addiction to wander had no cure. Hi Saadi, thank you so much for your lovely comment! I am so happy to hear that this article resonated with you. Its amazing how we are able to live in so many different places and yet connect with each place. I think each place leaves an impression on us. 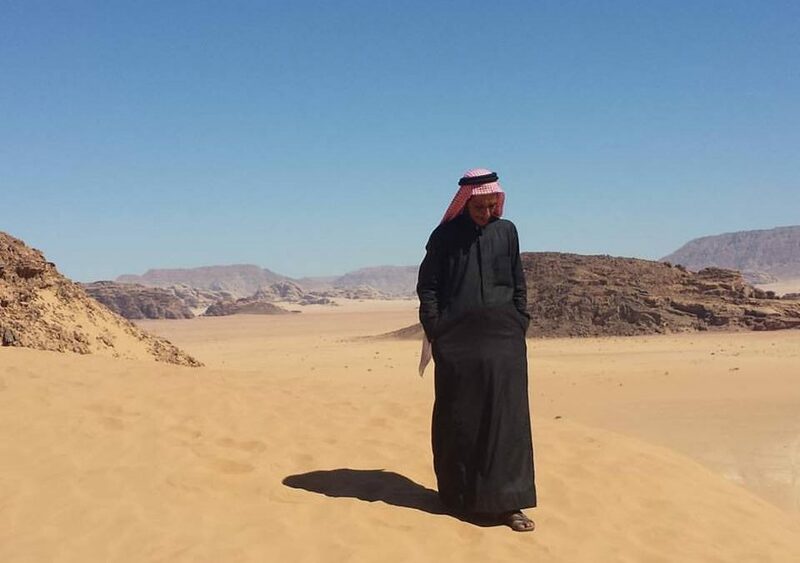 I too have always felt like a wanderer, which is why it was so inspiring to meet the local Bedouins on my journey to Jordan – a Bedouin will tell you that human beings have been wandering for centuries and that it is part of who we are 🙂 I think so many of us feel this way and are lucky to be able to enjoy this gift. Best of luck to you on your new life in Saudi Arabia!